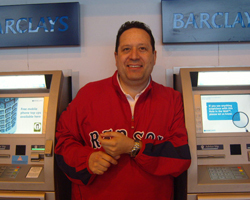 My research collaborator Bernardo Batiz-Lazo is quoted extensively in an article in the Smithsonian Magazine about the history and future of the ATM. The author of the excellent piece in the Smithsonian Magazine is Linda Rodriguez McRobbie. The “world’s first” ATM landed on a high street in Enfield, a suburb of London, at a branch of Barclays bank; there’s even a blue plaque on the outside of the building, still a Barclays, to memorialize the cash dispenser’s June 27, 1967, debut. The story goes that John Shepherd-Barron, an engineer at printing company De La Rue, came up with what was essentially a cash vending machine one Saturday afternoon after he missed his bank’s open hours.,,The machine transformed banking and Shepherd-Barron’s name went down in history: In 2005, he was made an Officer of the Order of the British Empire for his services to banking and the obituaries after his death in 2010 all called him the “inventor of the ATM”. The Smithsonian Magazine piece draws on Bernardo previous research. The paper I am currently working on with Bernardo is:The Changing Industrial Organization of Epistemic Communities During Hong Kong’s Progression Towards a Cashless Society (1960s-2000s). The period from the 1960s to c. 2000 saw a dramatic change in retail banking technology in Hong Kong. Initially the relevant technologies were installed and managed within the boundaries of large banks. More recently, a micro-payments solution called “Octopus” was developed by a consortium that included non-financial firms. These developments illustrate how, over the course of the period covered by this article, the industrial organization of the relevant technologies was transformed as the provision of much of the technology for retail payments was outsourced to non-bank institutions. This paper seeks to account for this shift in the organization of computer technology in Hong Kong by drawing on Transaction Costs Economics and the theory of the firm as an epistemic community.